Scan Gold Percentage, Karat Etc. 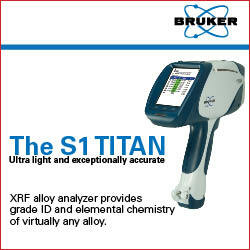 Swiftly with a Bruker XRF Gun! Testing gold jewelry quickly and accurately is an essential part of a variety of gold and jewelry businesses including gold jewelry manufacturing and gold scrap recycling. Speed and accuracy in hallmarking gold,karat (carat) verification or in sorting incoming gold scrap is essential to the profitability and reputation of a gold business. Contact the knowledgeable gold jewelry testing experts at Bruker today to find out how to increase efficiency throughout your gold business operations. Bruker gold jewelry testers provide gold concentration data and full alloy chemistry in as little as 2-5 seconds per sample, and testing is realized without any damage or alteration to the sample. Completely nondestructive analysis paired with accuracy within a few tenths of a percent of fire assay make testing gold jewelry easy for many businesses in the gold and industries. Handheld operation allows for easy, quick testing of large sample, incoming bulk scrap, etc. 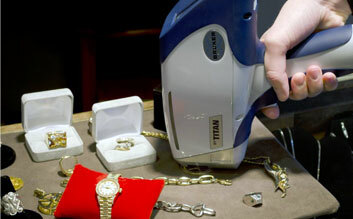 Contact us today to learn about Bruker’s nondestructive gold jewelry testing analyzers. We are active, Let's Connect.